Featured offers in this Sears Canada Black Friday 2015 Flyer valid 11/26-11/30/2015: $749.98 Kenmore Laundry pair; $999.99 Kenmore 5.8 cu. ft. True Convection Range; $1699.99 Kenmore 28 cu. ft. French Door Fridge with Bottom Freezer; $799.99 Kenmore Fully-Integrated Tall Tub Stainless Steel Interior Dishwasher; $499.99 Brute 22″ Snowblower; $75.00 Liz Claiborne Women’s Jacket; $88.50 Claiborne Men’s Parka; $19.99 Tradition Women’s Fashion Separates; $99.99 Citizen Eco-drive Men’s or Women’s Watch; $44.99 Any Size 600 Thread-Count Cotton Rich Reversible Sheet Sets; $499.99 Pro-Form 400 Crosswalk 2-chp Treadmill; $7.99 Kenmore 10″ Skillet; $899.99 Kenmore Tall Tub Stainless Steel Interior Dishwasher; $1499.99 Kenmore 4.6 cu. ft. Dual-Fan True Convection Slide-in Range; $649.99 Kenmore 18.2 cu. ft. Fridge With Top Freezer; $1299.98 Kenmore Front-Load Laundry Pair with AST; $949.99 Frigidaire Gallery Fully-Integrated Tall Tub Dishwasher; $1199.99 Frigidaire 16.7 cu. ft. Convertible Upright All Fridge/Freezer; $399.99 Frigidaire Gallery 1.7 cu. ft. Over-the-Range Microwave; $129.99 WholeHome 7′ Pre-Lit Tree with 5-Function Colour Changing Lights; $17.99 10K 6mm Crystal Ball Stud Earrings; $144.99 Heys Frontier 2-pc. Luggage Set; and more. 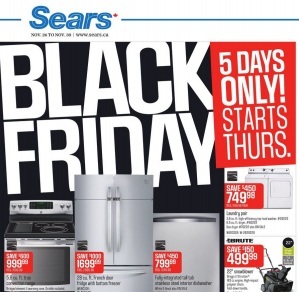 Find amazing prices in the latest Sears Black Friday Flyer.